The Philippines flag was adopted on June 12, 1898. It was designed by Emilio Aguinaldo. It features a white triangle on the left side. The colors are blue, red, white, and yellow. General Aguinaldo conceived and designed the Philippine flag and asked Marcela Agoncillo, wife of another Filipino patriot Felipe Agoncillo, to make the flag together with her daughter, Lorenza, who at the time was only seven years old, and a niece of national hero Jose P. Rizal. The Philippines flag is full of symbolism. The color blue stands for truth, justice, and peace. The red represents valor and patriotism. The eight rays of the yellow sun represent the first eight provinces. The sun represents the dawning of a new era of self determination that was desired in 1897 (when the flag was first designed) after the Spanish-American war and the US promise of independence, which was granted in 1946. To complete the symbolism of the flag, the red stripe represents courage and bravery and the blue stripe is for noble ideals and patriotism. The white triangle is symbolic of peace and stands for the Katipunan, a revolutionary organization that led the revolt against Spain and the color white represents peace and purity. The eight rays of the yellow sun represent the first eight united provinces that revolted for independence. The capital city is Manila, but the largest city is Quezon City. The Philippines flag is part of a nation whose national motto is officially “For God, For People, For Nature and For Country". The national anthem or song is titled “Chosen Land”. May 28 every year is Flag Day in the country. In line with this, the public are encouraged to display the Philippine National Flag in front of their houses and offices to commemorate the first official unfurling of the tri-colored "suns and stars" flag after a Battle of Alapan in Imus, Cavite wherein Filipino revolutionaries defeated Spanish soldiers. The observance of the Flag Day is a prelude to the celebration of the country's independence day every June 12. The yearly Independence Day celebration commemorates General Emilio Aguinaldo's unfurling of the Philippine National Flag amid the majestic fervor of the Marcha Nacional Filipina signifying independence at his Mansion (now Aguinaldo Shrine) in Kawit, Cavite, at 4:20 PM. on June 12, 1898. The same flag was unfurled in the Battle of Alapan on May 28, 1898 and proclamation of Philippine Independence 15 days afterwards. 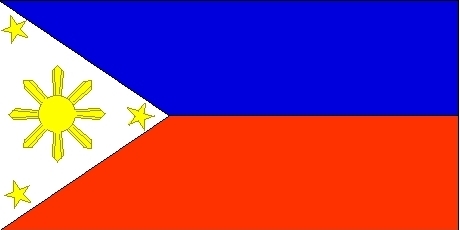 The Philippines flag, if flown from a flagpole, shall have its blue field on top in time of peace and the red field on top in time of war; if in a hanging position, the blue field shall be to the right (left of the observer) in time of peace, and the red field to the right (left of the observer) in time of war.